Is anyone able to make the DOA Compass work properly weather using the ULA or UCA? I would like to see examples of the ideal signal form we need in order to get a working direction on the compass. Example in the user manual are good but not clear on the exact peak or shape of spectrum needed. During my test I used my HackRF to create a SSTV signal. If you are in an area with a digital trunked radio system you could also try it out with the control channel frequency. I was able to successfully locate a tower site with that method. You'll want to make sure when you set your frequency and such that you have your filter frequency close to the bandwith of the signal you're looking to RDF. In my case I was working with a 25khz wide SSTV signal so my filter was set to 30khz and worked quite well. I'm using a 915MHz Dipole on a metal ground plane with antennas spaced a 9.8cm. Using an HP8920A for Tx 904.28MHz @ 5KHz dev with a 1KHz tone. Once the BW, FIR and Decimation are right the arrow points to the direction of the Tx from -45 to 45 degree properly. Mobile test: Installed the mag mount Dipole on the roof of a vehicle, set de same adjustments as bench test. Tx is a radio tower atop a building I can put in test mode (continuous Tx with data) and could not get the arrow to point to the Tx. I was wondering if anybody had good results. Thanks Corrosive for your reply. I did try this atop my car and can confirm the linear array to be far easier to setup and use than the circular. I'll be doing some more tests later in the week and plan to release a video of my RDF'ing a tower site. I did notice while moving that multi-path was an issue and my best readings were often then I stopped my car and waited a moment for the reading to settle out. Next time I'm planning to work harder on my circular array and attempt to get a recording of a mobile RDF session. After several hours of fine tuning, I'm able to get a nice bearing on the ULA (linear array) but, could not get the UCA (Circular array) to get a nice bearing. Anyone else having the same issue? Are we sure the drawing and info on the UCA is good? 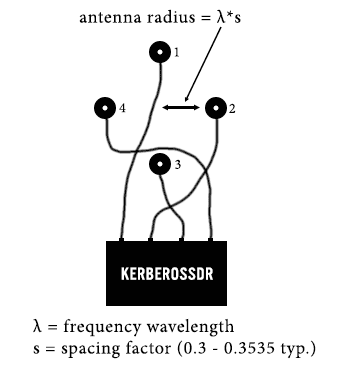 What frequency, spacing factor and antenna radius are you using? λ*s is correct. Using dipole antennas on a 50x50cm ground plane. On which side channel 1 should be on ULA? Its not numbered on the picture. I mean should channel 1 be most left or most right of the antennas?